Ottomans initiated the West to the pleasures of opium, coffee and tulips. For their reward, they got literally “smoked” by Europeans, who started exporting tobacco to Turkey in the early 1600s. Several ulema soon realized the dangers of the new substance and preached against it, to little avail. One of those “voices in the wilderness” is that Ahmad al-Rumi al-Aqhisari (d 1041/1631 or 1043/1634), a reformer from Anatolia largely forgotten in his own country, but whose influence can be traced as far away in India in the 19th century. 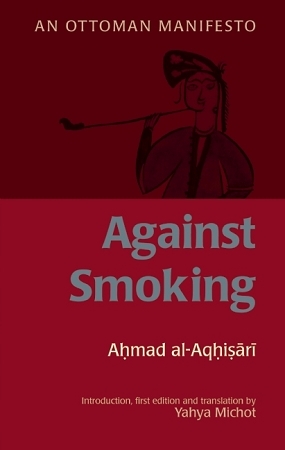 His Epistle on Tobacco (Risaleh dukhaniyyeh), one of the earliest Arabic texts against smoking, is presented here for the first time in a scholarly edition, together with fully annotated English translation. Al-Aqhisari’s arguments draw on the Qur’an, hadith, medicine, and suspicions of the West. Michot’s introduction sets those arguments in the context of the author’s works and his epoch, and explores them in relation to his personality, and the views of other Ottoman scholars, from Birgivi and Qadizade to Kitib Celebi and ‘Abd al-Ghani I-Nubulusi. Michot suggests the existence of a Turkish “Taymiyyanh” school of pre-Wahhabi radical pietism, and underlines the modernity of some of its “fundamentalist” concerns, notably against smoking. Yahya Michot lectured at Louvain and, from 1998 to 2008, taught Islamic theology at the University of Oxford. He now processor of Islamic Studies and Christian-Muslim Relations at Hartford Seminary (Connecticut). He devoted earlier books to cannabis and Sufism in Mamluk Egypt (2001), and to opium and coffee in Ottoman Turkey (2008).